Tropeaka Lean Protein Review: Just a Touch Above Average. Tropeaka Lean Protein reviews are few and far between at this point, but I’ve been looking forward to trying this brand for quite some time. 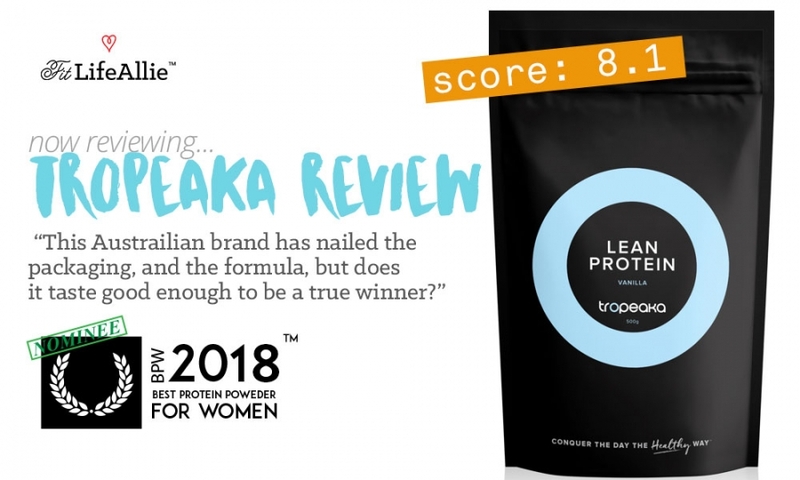 Thankfully, I’m finally in a position to give you my thoughts on the flagship protein product from ‘new-kid-on-the-block’ brand, Tropeaka. After doing plenty of testing and taking sip after careful sip of the Tropeaka protein, I finally have enough information to tell you almost everything you could ever want to know about this protein. In this Tropeaka review I’m going to tell you not only what the BEST FLAVOR of Tropeaka Vegan protein, but also what my thoughts are on the quality of the formulation, and then even a fun little breakdown of the Tropeaka protein. So if you’re here to learn EVERYTHING there is to know about Tropeaka, than you have to come to right place. Let’s get this review started. Tropeaka is an unusual brand name, let’s at least agree on that right away. It sounds like the name of the town in Kansas where my ex is from. Er. Wait. That was ‘TO-peka’. LOL. Seriously though. What kind of a name is ‘Tropeaka’ anyways? Actually you know what this is actually an Australian company so maybe Tropeaka is the name of some fancy healthy town in Australia. Who knows? Certainly not this dumb American. But geographical acumen aside, I DO know a thing or two about the brand’s flagship product, Lean Protein. And that’s really why you’re here today, let’s face it. In the next few paragraphs I’m going to go in-depth regarding the Lean Protein from Tropeaka. Why don’t I lead off with the first thing ANYONE EVER notices about ANYONE, or ANYTHING, protein powders included. The LOOKS. I always give it to you guys straight. If it looks good, like the Ora Organic products, I’ll tell you. If it looks BAD, like the disastrous new PEScience Vegan protein, I’ll also tell you that straight up. This Tropeaka brand is a new one to me. It’s one that has all the look of other hot new Aussie brands, like Happy Way, but this one is just a little more refined in terms of the aesthetics. Now. Before I keep going, let me take a second to say that I really don’t like the ‘bagged’ protein powders that you continue to see all over this vegan protein industry. Like. Put your powders in a dang jar already. I hate getting protein powder all over my nails and all over my hand when I am digging around these foolish stand-up pouches. But the Tropeaka pouch, if nothing else, does look handsome. I’ll give it that. The pouch utilizes primarily a dark color scheme, over which sits professionally selected graphics. Not many of them, but the ones Tropeaka DID choose look great. The feature graphic, which also happens to be Tropeaka’s main logo, is just a large circular shape. On Lean Protein, the ‘ring’ is light blue, which contrasts beautifully against the dark background. The name ‘Lean Protein’ sits prominently in the middle of the circle, with the flavor, and company name being the only other features on the front of the package. I like the Tropeaka Lean Protein packaging because it is simple, yet attention-grabbing. It doesn’t necessarily give you insight into WHAT the product DOES or TASTE like, but oddly enough I don’t care. I would rather something be aesthetic than practical. I mean. Why does anyone buy anything? It makes them feel something. And while my Longchamp and my rings will always make me feel much more than my bag of protein, the fact remains that the Tropeaka product looks very nice. I’ll give it a 9.2/10 on the packaging. Let’s talk about the formula within the package now. Is the Tropeaka Protein a high-quality Formulation? This is where some proteins fall short. In the formulation. Some of them will have the wrong macros, or just have weird macros like the Primal Fuel product from Primal Kitchen. That is such an odd one. Then some others will claim to be some sort of crazy superfood, nutrient-dense powerhouse, but in reality be primarily a pea protein product with just a fairy-dusting of some superfoods. But for the most part, most of these vegan protein powders are very similar. Some combination of vegan sources, usually pea, hemp, sacha inchi, cranberry, quinoa, and brown rice. And then they will be naturally flavored and sweetened. Most do have some special add-ins to add marketing hype. And guess what? Tropeaka is just exactly that. Let me list out the ingredients for you below and then we’ll discuss my thoughts on whether or not this is actually a quality product or not. So again- this is a pretty normal formulation. You have pea protein, brown rice, and sacha inchi making up the primary protein sources, while a handful of other superfoods create a supporting cast. I do like the inclusion of maca, ginger, dandelion, and cardamom to give some added hype to this product. This shows Tropeaka has a good handle on what the consumer really wants in this day and age. Now. There is always the very likely possibility that the superfoods are included in very small quantities in Tropeaka Lean protein, much like some of the other vegan proteins I’ve reviewed. And you can’t REALLY fault them for it. After all, who wants a protein powder that tastes like straight up turmeric or ginger? No one. Absolutely no one. Speaking of TASTE though, let’s have a discussion now around taste and flavoring. Is Tropeaka Lean Protein actually good? And what’s the BEST flavor of Tropeaka protein? What’s the Best Flavor of Tropeaka Protein? There are two flavors of Tropeaka Lean Protein. I found that the vanilla and chocolate flavors are just about the same actually in terms of the taste. Meaning that after trying both, I didn’t really have a strong preference of one over the other. So what’s the verdict though? Does Tropeaka Lean Protein taste good? Hm. So. It’s tricky. Most of these Vegan protein powders don’t taste awesome. Often times they taste more or less like pea protein with a bunch of stevia packets in them. Oh wait. That’s what 95% of them are. Lol. But yeah this Tropeaka protein is a little bit better. The consistency is a touch smoother than other vegan proteins, and the flavors themselves are relatively strong. Sometimes it seems like the flavors just aren’t that strong but both the chocolate and vanilla flavors are quite ‘deep’. If there is one drawback of the Tropeaka Lean Proteins from a flavoring standpoint, I would say it’s that the stevia does leave a tiny bit of an aftertaste in your mouth. It’s not crazy, but it’s definitely significant and has that ‘bitter’ stevia taste. Again. Not a deal-breaker necessarily. And it is something that you get used to as you sip on Tropeaka Lean Protein, but still worth mentioning. Ok. Let’s wrap this up.